A few months ago I got an email from the wonderful people at Robert Kaufman asking me if I would like to make a mini quilt highlighting the Kona color of the year, Highlight. Yes, yes, yes! They sent me a big stack of different Kona colors and gave me freedom to do whatever I wanted as long as the finished quilt was 20" square and as long as it highlighted Highlight. Here is my finished quilt. My inspiration came from a box of tissues that had a simple plaid pattern - I wish I had taken a photo of it before it got lost in our move. It was so much fun to spend so much focused time on this project. I made large template pieces to construct the block and then handquilted lines 1/2" apart, leaving the highlight strips unquilted. I am thinking about turning this into a pattern to make a quilt for my son's bed but I will need to come up with a simpler way to put it together. My quilt - along with 59 others - was in a Kona Color of the Year booth at Quilt Market this past weekend. I had no idea what other people had made and it was so fun to see the different directions that people took. What a clean, wonderful design! Well done! Very nice! I'm a highlight fan. Is there somewhere online we can see the collection? 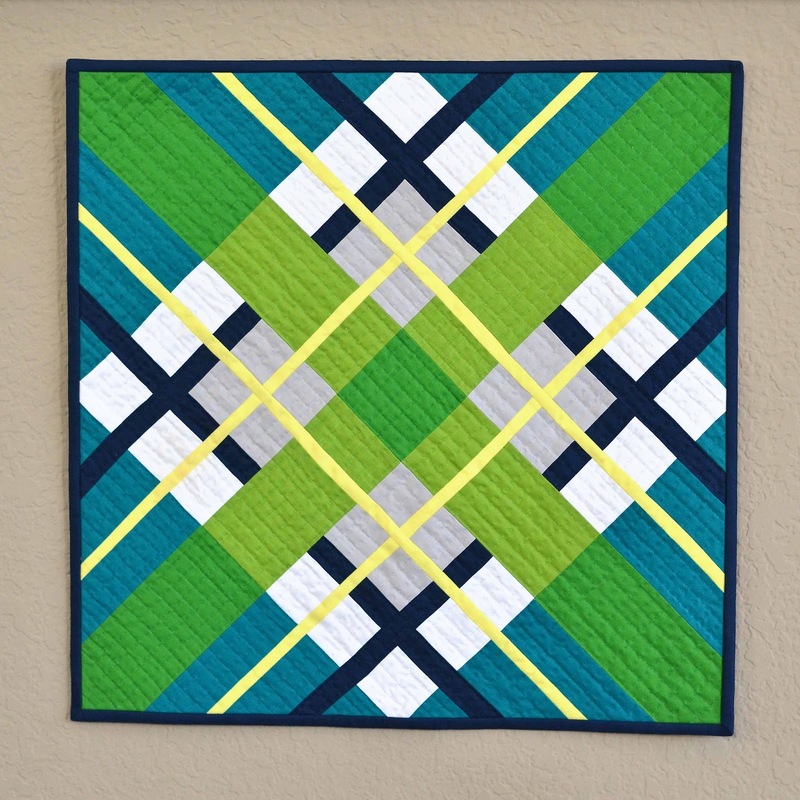 I love, love,love this little quilt! Would love to see it in a larger size. wow ! you nailed it ! A really striking and stunning mini. I have to admit that I would a much larger version of the same to put on my bed! This is the first time I've really liked the highlighter color, too. Oh, it turned out beautiful! Well done. Might you be offering a pattern for this lovely quilt? I would enjoy making one of my own. I love that you only used a few skinny pieces but they make the whole mini quilt pop! Love this!! I'd love to make it, any size. Love that you got your inspiration from a tissue box! And I would love to see this pattern made into a larger quilt. Figuring out the construction part is so fun. Looking forward to what you come up with! Love this! 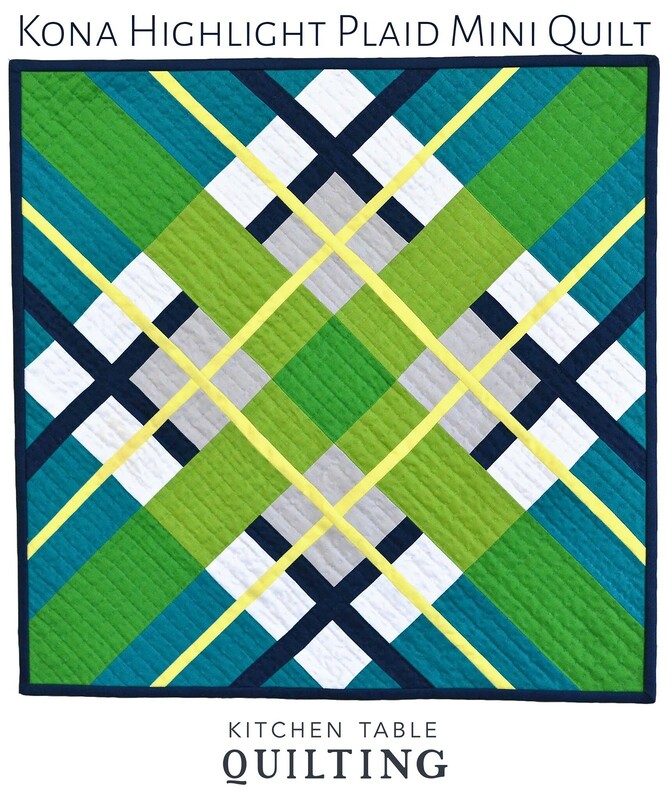 I'd be interested in the pattern for just the 20" quilt!